This hierarchy also ties into the band's support of the military and Zoltan's support of Donald Trump. 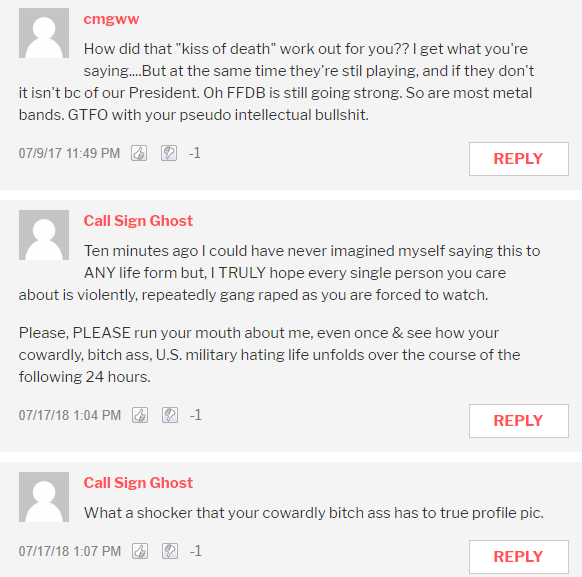 The way Five Finger Death Punch sees the military is not dissimilar from the manner many American nationalist/patriots are raised to - men who are braver and better than the rest of society and deserving of unquestioning respect. You can see this idealization pretty clearly in some of their songs, such as "Death Before Dishonour", where they claim that everyone's living a fake life except for the soldiers who die with their dignity. There's a common trope amongst conservative types that soldiers are basically always right, from atheist professor variations, to God's Not Dead 2 making a point of having the evil atheists kick a marine off the jury, to the portrayals of soldiers as morally and intellectually infallible in American Sniper and (especially) 13 Hours. Soldiers obviously do deserve respect - they are serving their people and are often away from their families as a result of that, not to mention the inherent risk involved in the job. However, the level of lionization is just plain ridiculous sometimes and they even get used as a symbolic cudgel to beat down any sort of opposition to nationalism. Considering that no one in Five Finger Death Punch has actually served in the military, it's a little bit odd that they fetishize them as much as they do. The band even goes so far as to collect dog tags from their fans to display behind them at concerts, almost as if they're trying to gain that legitimacy through association. When you consider that, for conservative types, "the military is romanticized and portrayed as an institution of national pride [which] focuses on the prestige associated with enlisting in the Marines and serving one’s country", it's really not that surprising that you can have a band that punches down in their music and submits to authority because they fall in line when someone more powerful than them comes along. There's certainly nothing wrong with cultivating a military following with your music. Ivan Moody has a story he tells about a soldier who died in Iraq while listening to one of their songs, which is undeniably moving. Other bands, such as Disturbed, have written music with the expressed intent of encouraging the troops. 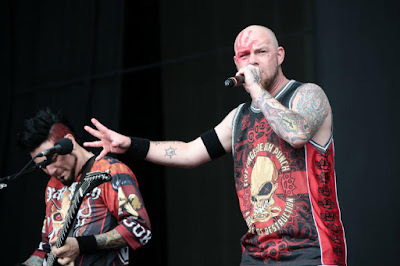 I just find it really interesting that Five Finger Death Punch can rage uncontrolled at the whole world and posture like they're ultimate badasses, but then make so much of a show about being submissive to authority. It seems to run counter to their message until you understand their ethos a little better.